Making a New Year’s Resolution is easy, sticking to it is something totally different. So we decided to share our goals for 2015, that way we can hold ourselves accountable. Below is what we would like to accomplish here in Oak Cliff over the next year. The expansion of the Bike Share Program at Fair Park is essential to its success. The availability of the Bike Share Stations and the system’s convenience will encourage ridership. Currently the most direct routes are unsafe for cyclists. The newest park in Dallas as well as the locale with the trendiest restaurants is only about 5 miles away from Oak Cliff and should be more accessible by bicycle. The traffic on Beckley Ave is too fast to ride safely in the street and the sidewalk is too rough to ride. Not to mention the tunnels at the bottom of the hill remind me of the opening scene of Indiana Jones and the Raiders of the Lost Ark. The other option is a combination of Edgefield Ave and Sylvan Ave. However, the last leg on Sylvan is through an industrial district that I do not feel comfortable riding with a group. We would love to have greater access to this great new public space. 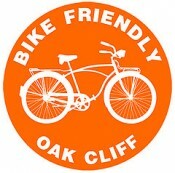 to welcome motorists and rail car passengers to our beloved Oak Cliff. Pot holes, poor lighting and streets in disrepair may be a nuisance to motorists, but to cyclists, road conditions are critical. Also, a road that’s safe for cyclists is better for everyone in the community. No more pot-holes to tear-up motorvehicles, street lights to allow safe driving and deter crime will be appreciated by all our neighbors. We know we can’t achieve these goals alone; we hope to have your support! Happy New Year, Oak Cliff, let’s make it a good one!